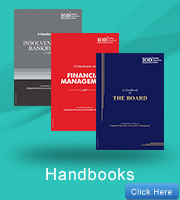 IOD's extensive range of in-depth professional books and conference material help member directors to refresh and further develop and update their boardroom and business skills. Director's Information and Advisory services are to be further supported by corporate tax and legal helpline. 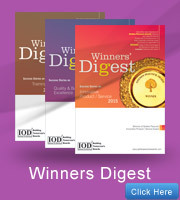 IOD publishes a large number of books and journals throughout the year, to keep their members updated on current and emerging corporate director and board related public, legal, and policy issues and trends through IOD and related websites, bringing out papers, survey reports, monthly journal (Director Today), Director's Handbooks, Winners Digest, Conference Proceedings and Souvenirs. IOD continues to be at the forefront in driving industry and research based surveys and reports, on topical subjects concerning boardroom functioning. 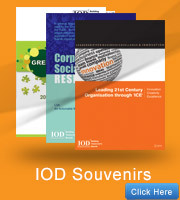 It publishes over 5 books each of international conference proceedings and souvenirs, each year. 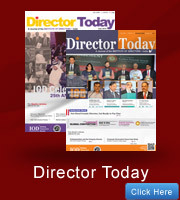 IOD publishes a range of 'Handbooks for Directors', covering total range of corporate functional areas. Over 10 such handbooks have already been published and highly rated as ready reckoner reference books for director’s shelves.